A good friend got in touch with me regarding this month’s book. She helps out with the MNDA which is a charity to support people with Motor Neurone Disease and came across this author. I immediately downloaded the book and loved it and got in touch with the authors cousin who has provided the brilliant illustrations in the book. Each month I feature a book as I have a real love of books and reading but also one of my son’s neonatal nurses told me to look into the benefits of reading to premature babies. Studies show that it helps parents to bond with their baby, it settles baby as they get to hear the familiar voices of their parents and compared to the premature babies that were not read to the studies showed an increased development in communication skills when they were older. It’s Mr Snuffles’ birthday and his dream present is a basket of his favourite tasty treat, truffles! But hunting through his woodland home, and visiting all his usual spots, he discovers that there are no truffles to be found. Could it be that a truffle thief has got there first? And not only that but all the people he meets – from his old friend Mr Snorer, Gnaw and Gnawma the Snorey Boars and Herbert the Hoggle and his hoglet Herby – seem to be all dressed up in their finest as if they’re going to a party to which he’s not been invited! Feeling very sorry for himself, and empty pawed, Mr Snuffles decides to call it a day. But, as he gets closer to home he picks up a wonderful, unmistakable fragrance and the sounds of laughter. Will Mr Snuffles have truffles and fun on his birthday after all? Inspired by the author’s love of the countryside, and vividly brought to life by acclaimed illustrator Emily Wallis, Mr Snuffles’ Birthday invites us to join the author in his wonderful woodland world. Inhabited by a host of memorable characters, Mr Snuffles is the perfect next read. Born in Yorkshire in 1985, David Greaves’ warmth and generosity of spirit, and his love of travel and adventure led him to make friends around the world with people from all walk of life. His strength of character and devotion to achieving his goals was shown in his achievements as an ultra-marathon runner and Iron Man triathlete. It was also shown by his determination to finish this book, and nine others, after being diagnosed with Motor Neurone Disease (ALS) in June 2015, just after his thirtieth birthday. In the fifteen months after his diagnosis he got married to the love of his life,, climbed Mt Kilimanjaro, raising over £12000 for the Motor Neurone Disease Association, and travelled through East Africa before setting in Newcastle upon Tyne. As David lost the use of his arms and speech he finished his collection of children’s books using revolutionary Eye Gaze technology which allowed him to type by tracking the movement of his eyes. David passed away peacefully at home in September 2016. Mr Snuffles is David’s first book and his wife Philippa and family intend to honour his memory by eventually publishing all his completed works. 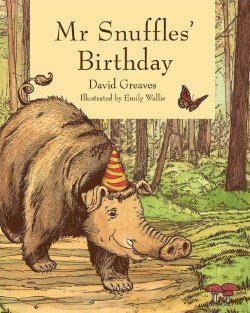 The first book in the series, Mr Snuffles’ Birthday by David Greaves and illustrated by Emily Wallis (published by Clink Street Publishing 1st May 2018 in hardback and ebook) is available to purchase from online retailers including Amazon and to order from all good bookstores.